These are additional musicians that have played with Mickey Mulligan on and off over the years. Ever since Rowan O'Connell left the band, they have been seriously lacking in Scottish blood. Until Michelle Burns came along. Of course, she wasn't selected for her roots, her last name, or even her singing voice - which happens to be exceptional - or most especially her attempts at various percussion instruments. (Hint: never offer her a piece of gum during a performance.) No, she was selected by the way she moves to the music on stage, and more importantly how male fans would react to this distinctive motion. It works. Trust us. And while you're admiring the view, enjoy Michelle's superb lead and backup vocals. Although they met in Pensacola, Michelle joined the band once Mickey moved it to the Hampton Road area of Virginia. Frances Michaels was barely accepted on stage with The Travelers, since she does not fulfill the current requirement for facial hair. But since the only apparent options were a follicular transplant or not have a talented fiddle player, Mickey chose to fund the follicular transplant. However, the cost being prohibitive on such an experimental procedure, Mickey has now lifted the facial hair requirement. In the process, The Travelers gained a talented fiddler who plays with the Celtic and Bluegrass group June Apple, as well as the Pensacola Symphony. Frances has played the fiddle her whole life, having been the recipient of multiple awards in the Southeastern United States for her talent. She played with the band during their gigs at Paddy O'Leary's Irish Pub in Pensacola Beach, Florida, as well as the 2002 Reunion Tour in Pensacola, Florida. Mickey was canoeing down a secluded river in northern Georgia (in the United States) when he passed beneath an old rickety people bridge where there stood Gerald Patrick O'Hara, blankly grinning and picking the banjo. Pigs could be heard squealing in the distance. It had the surreal feel of a movie scene. After passing through rapids, and narrowly escaping with his life, Mickey returned to locate Gerry, whose musical talent extends beyond the banjo to the mandolin and guitar as well. Soon, Gerry was providing The Travelers with some added rhythm, not to mention being the tallest member of the group. He also fulfills the current requirement for facial hair, and the requirement to wear a derby if your primary instrument is the banjo. He played with the band during their gigs at Paddy O'Leary's Irish Pub in Pensacola Beach, Florida, the 2002 Reunion Tour in Pensacola and surrounding areas, and continues to play once the band moved to the Hampton Roads area of Virginia. Mickey hired Matt because 1) his first name starts with an "M," 2) he pronounces his last name incorrectly, 3) he sports the mandatory facial hair, and 4) he plays bass, which is really cool. Matt is the youngest musician to play with The Travelers so far, but who cares since this sentence is only filling up space. Matt gives drive to the lively Irish drinking tunes, even though they already had it. But he gave it something more, like sort of a low-sounding "dum-dum" noise. Like a bass. He has played in numerous bands, usually the type you don't go out of your way to listen to unless you still have the suffix "teen" in your age. Coincidentally, Mickey met Matt at the same place and in the same frame of mind as he met Bill Wendt. Matt's talent is obvious, and as most decent (who says Matt is decent?) bass players are, he is the backbone of the rhythm. 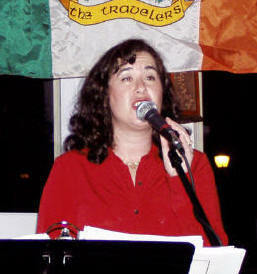 He entertained with The Travelers at Johnny's Tavern in Overland Park, Kansas, and the 2001 Reunion Tour in Kansas City. One night due to the increasing entropy in the known universe, Brian Swan showed up to one of Mickey's show and whipped out his whistle. Actually, he whipped out all of his whistles, and he began to play them (one at a time, of course). His musical talent extends beyond his vast collection of tin whistles, however. He is a balladeer with a fine tenor voice who once directed the Naval Aviation Choir in Pensacola, Florida. But it wasn't his musical talent that got him his job as one of The Travelers. Oh, no...check out the facial hair!. 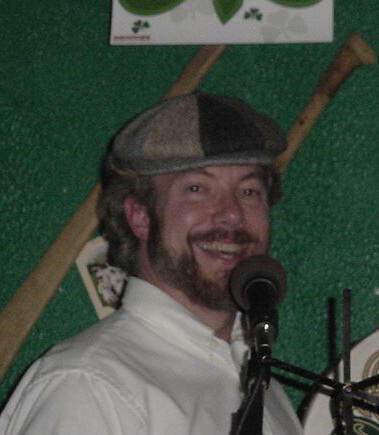 He has played numerous times with Mickey at Paddy O'Leary's Irish Pub in Pensacola Beach, Florida, including St. Patrick's Day of 2003. Séamas Taylor was born on the bayou. No, actually he wasn't. We just thought that sounded cool. In reality, he is a multi-talented entertainer who has starred in the lead role in the children's musical "Schoolhouse Rock," and presently entertains by singing and playing piano at the piano bar Rosie O'Grady's located in Seville Quarter in Pensacola, Florida. One night Mickey, thinking the grand piano to actually be an accordion, attempted to lift it and begin playing. Séamas was the first (and the angriest) musician to throw Mickey out the door and into the gutter. Less than three hours later, Séamas and Mickey were rolling in the gutter with laughter, after Séamas had been similarly ejected after goosing a waitress. 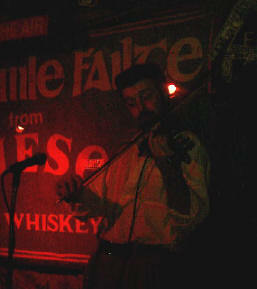 How Séamas ended up playing fiddle with Mick at McGuire's Irish Pub in Pensacola, Florida is a complete mystery. He also played for the 2002 Reunion Tour in Florida. But he does have the facial hair. And just to answer your question, he is not related to the "famous" musician James Taylor. Bill Wendt is a multi-talented musician who will never replace Jack Duggan. Or Rowan O'Connell. Or especially Colleen Galbreath. Period. He can't play mandolin, tune a banjo, or rosin a bow, and he can't sing harmonies. But he doesn't make fun of Mick's balding head (like Jack did incessantly), so he was hired. Besides, he fit the new requirement for all musicians (other than the boss) to sport facial hair. Bill has played numerous instruments over the years, both for and with a wide variety of bands. 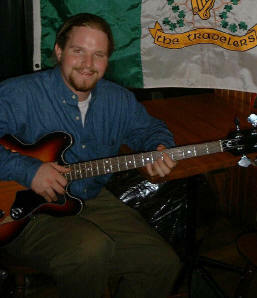 For The Travelers, he played back-up and occasional lead guitar on both six-string and twelve-string, and also percussion on his rain-proof, bomb-proof bodhrán during the fall and winter of 2000, as well as for the 2001 St. Patrick's Day Reunion. He met Mickey while they were both in a drunken stupor at O'Dowd's Little Dublin in Kansas City, Missouri, and they entertained the crowds together at Johnny's Tavern in Overland Park, Kansas.